The Test tab in Advanced eDiscovery enables you to test, compare, and validate the overall quality of processing. These tests are performed after Batch calculation. By tagging the files in the collection, an expert makes the final judgment about whether each tagged file is actually relevant to the case. 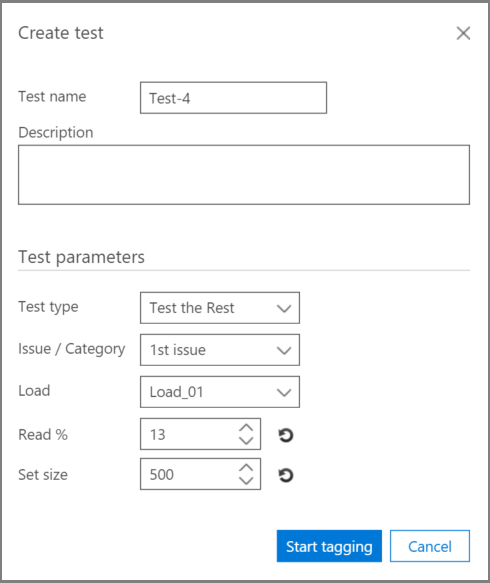 In single and multiple-issue scenarios, tests are typically performed per issue. Results can be viewed after each test, and test results can be reworked with specified sample test files. The "Test the Rest" test is used to validate culling decisions, for example, to review only files above a specific Relevance cutoff score based on the final Advanced eDiscovery results. The expert reviews a sample of files under a selected cutoff score to evaluate the number of relevant files within that set. 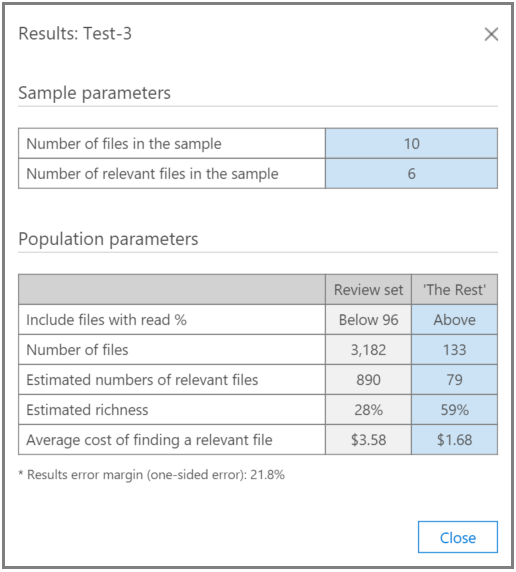 Test sample statistics of the number of files in a sample and identified relevant files. Tabular comparison of the Population parameters of the Review set and the Rest, for example, the number of files, estimated number of relevant files, estimated richness, and the average cost of finding an additional relevant file. Cost parameter settings can be set by the administrator. Open the Relevance > Test tab. In the Test tab, click New test. The Create test dialog is displayed, as shown in the following example. In Test name, and Description, type the name and description. In the Issue / Category list, select the issue name. In the Load list, select the load. In Read %, accept the default value or select a value for the cutoff Relevance score. In Set size, or accept the default value. Note that the restore icons will restore the default values. Click Start tagging. A test sample is generated. Review and tag each of the files in the Relevance > Tag tab and when done, click Calculate. In the Test tab, you can click View results to see the test results. An example is shown in the following figure. In the figure above, the Sample parameters section of the table contains details about the number of files in the sample tagged by the expert, and the number of relevant files found in that sample. The "Test the Slice" test performs testing similar to the "Test the Rest" test, but to a segment of the file set as specified by Relevance Read %. In the Test tab, click New test. The Create test dialog is displayed. In Test name and Description, type the information. In the Test type list, select Test the Slice. In the Issue list, select the issue name. In Read % between, accept the default low and high range values or select values for the cutoff Relevance scores. In Set size, select a value or accept the default value. The restore icons will restore the default value. In the Test tab, you can click View results to see the test results.